“President Trump made a promise to bring back jobs to America. The spirit of optimism sweeping the country is already boosting job growth, and it is only the beginning. President Trump claimed undue credit for ExxonMobil’s investment announcement — the latest example of the new president’s now-predictable formula: A company announces a U.S. jobs plan that predates Trump’s presidency. The company gives a nod to Trump’s anti-regulation policies. Trump then takes credit for bringing jobs back to the United States. Repeat. Among the many problems with this exercise is that hiring pledges aren’t binding. Plans change, and the jobs don’t always come to fruition. For example, in 2013, Foxconn announced it would create 500 jobs at a new high-tech factory in central Pennsylvania. The factory was never built, and the jobs never came, The Washington Post’s Todd Frankel reported. Yet the company recently announced a plan to invest $7 billion and hire up to 50,000 workers — a plan that Trump then touted. We took a look at ExxonMobil’s investment program, and a host of other corporate decisions that Trump falsely touts as a fulfillment of his promise to bring jobs back to the United States. We’ll keep a running tally, and update the list as necessary. On March 6, the oil giant announced its “Growing the Gulf” investment plan to spend $20 billion over 10 years in projects in Texas and Louisiana. The company said its plan would create 35,000 construction jobs and 12,000 full-time jobs, through 11 chemical, refining, lubricant and liquefied natural gas projects. The company acknowledged that its investments began in 2013 and are expected to continue through at least 2022. Indeed, ExxonMobil and other oil companies have been expanding and investing in the Gulf Coast for years, using new hydraulic fracturing technologies to extract natural gas and export it overseas. In 2013, when ExxonMobil began its investments, there were more than 120 petrochemical construction projects totaling $80 billion that were announced for the Gulf Coast region, the Houston Chronicle reported at the time. “The energy industry has proven it can operate safely and responsibly. Private sector investment is enhanced by this Administration’s support for smart regulations that support growth while protecting the environment,” Woods said, acknowledging Trump’s pro-business policies but stopping short of giving any credit to the administration for his company’s business decisions. Here’s a running list, and a link to separate fact-checks where available. Ford. Ford decided to expand in Michigan rather than in Mexico. But the decision has more to do with the company’s long-term goal — particularly its plans to invest in electric vehicles — than with the administration. Here’s what Ford chief executive Mark Fields said about the company’s decision to abandon plans to open a factory in Mexico: “The reason that we are not building the new plant, the primary reason, is just demand has gone down for small cars.” Read the full fact-check. Update: On March 28, Trump tweeted about a forthcoming jobs announcement by Ford: “Major investment to be made in three Michigan plants. Car companies coming back to U.S. JOBS! JOBS! JOBS!” The investment projects announced later that day were in line with the contract Ford negotiated with the United Auto Workers in 2015. Fiat Chrysler. The company announced its plan to invest $1 billion in Michigan and Ohio plants and create 2,000 jobs. Sergio Marchionne, the Fiat Chrysler chief executive, said his company’s plan to invest $1 billion for a factory in Michigan had been in the works for more than a year and had nothing to do with Trump. Marchionne credited instead talks with the United Auto Workers in 2015. General Motors. The company plans to add or keep 7,000 jobs in the United States and invest $1 billion. Trump touted the decisions on Twitter, but a company spokeswoman said the decisions “had been in the works for some time” but that “the timing was good for us to share what we are doing.” Just two weeks before GM’s announcement, Trump had blasted the company on Twitter over its Mexican-made models of the Chevy Cruze. Update: On March 15, Trump took credit for General Motors’s plans to rehire about 700 laid-off workers in Michigan and create 200 new jobs. But the company did not credit Trump or his election. Walmart. Walmart said it would create 10,000 jobs in the United States in 2017 — a part of a $6.8 billion capital spending plan announced in October, before the presidential election, Reuters reported. Intel. Intel announced it would create at least 10,000 jobs at a “new” plant in Arizona. But Intel actually announced a $5 billion investment in this factory in 2011 with then-President Barack Obama. The factory never opened, making it technically “new” in 2017. The company told CNN Money that it’s resuming its factory project because it is expecting a demand in the computer chips to be created there. Lockheed Martin. Trump says he lowered the cost of the company’s F-35 Joint Strike Fighter planes. But the Pentagon had announced cost reductions of roughly $600 million before Trump began meeting with Lockheed Martin’s chief executive. Read the full fact-check. SoftBank. The Japanese company announced its $100 billion technology investment fund three weeks before the U.S. elections, when Trump faced a narrow path to victory. After a December 2016 meeting with President-elect Trump, SoftBank announced that $50 billion would go to the United States. But the United States outpaces all other countries in venture capital investments, and it is questionable that none of the $100 billion would have gone to the vibrant and promising tech industry in America — regardless of whether Trump was elected. Read the full fact-check. Sprint. Sprint announced it would add 5,000 jobs in the United States, and Trump took credit. Sprint later said its hiring plan was a part of a commitment by SoftBank, which owns a controlling stake in Sprint, the New York Times reported. Alibaba. Chinese e-company Alibaba pledged to create 1 million U.S. jobs. Trump said that until he got elected, Alibaba founder Jack Ma had “no intention” of investing in the United States. But Ma has been pitching his company as a U.S. job creator since as early as 2015, when Ma outlined a plan similar to what he promised in his announcement with Trump. Update: Ma withdrew the offer in September 2018, claiming Trump’s trade war with China nullified the deal. But experts doubt it was ever real. Charter Communications. Trump trumpeted the company’s March 24 announcement that it would invest $25 billion in the United States and hire 20,000 workers over four years, but the company’s jobs plan was in the works as early as June 2015. Foxconn. Trump touted Foxconn’s July 2017 investment announcement, but the company considered investing in U.S.-based facilities since 2014, though its initial plans to invest in Pennsylvania didn’t pan out. When Trump celebrated the company’s decision, the Wisconsin Legislature had not yet approved the $3 billion incentives package for Foxconn, amid concerns that the state would use taxpayer money for a project that would not generate profit for Wisconsin until 2042. Trump has promised to create 10 million jobs over the next four years, and that ultimately is what he will be judged on. (We are tracking this promise and more on the Trump Promise Tracker.) All the job announcements in the world will mean little if actual hiring does not turn up in the monthly reports from the Bureau of Labor Statistics. 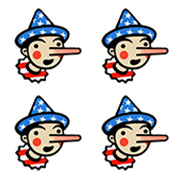 In the meantime, he earns Four Pinocchios for his repeated, inaccurate claims of credit. "Already, we’re seeing jobs coming back. Since my election … just today, breaking news, General Motors announced that they’re adding or keeping 900 jobs right here in Michigan."